Not too long ago, we introduced the concept of "Interest Growth" as a Chart type in TechNews. Our observation was that while there are a number of charting methods for showing accumulation of coverage (trendlines, etc. ), of comparisons between competitors (share of voice) -- no one had offered a great way to crack open the coverage on the basis of the net new author interest in the topic over time. There is a huge benefit to being early to discover authors that just started participating in a conversation. You can click on any of the authors on the right to see that first instance of them covering the topic you searched for. And there is also a power in understanding the rate of interest growth over time (to make sure you are aligned with topics that actually have a growing amount of media attention). In addition to being first to detect brand new authors jumping into specific conversations (of huge value to tech PR), Interest Growth charts in TechNews allow smart PR pros a new way to observe a trend's either growth or decline over time in ability to attract net new authors. Historically share of voice (SOV) tooling by the PR platform providers has delivered a very finite scope--giving PR pros basic charts to demonstrate “how are you doing?” relative to your competitors. At TechNews, we thought the far greater value in the SOV exercise was exposing a dataset that would allow tech PR pros to see where they could be doing BETTER. We also saw an opportunity to make the charting so easy that anyone could do it, without "training" or a "customer success" manager. Each topic has a Display Name (what goes in the legend) and a Search Query (where you can tune the query to define what's represented in the dataset). Add as many other topics you wish to compare. Click "Chart" and your chart gets generated. Explore all of the authors represented in the dataset (the image here only shows the first 20 rows, but you can literally go through thousands of matches in a very efficient way to see precisely what authors and outlets are covering one thing but not the other). You can toggle to a view on the outlets, and even "sort by influence" to investigate suspected outlets of particularly high site traffic. And you can click on any outlet or author to see all of the matching results. SOV in TechNews is about the higher IQ question of what ARE these results and where are the related OPPORTUNITIES for us to expand our media exposure. We go far beyond the cursory step of the pie chart and give tech PR pros a much more valuable underlying dataset to explore, to instruct how you map out your strategy. TechNews is different than other PR platforms. One fundamental difference is our singular focus on the tech industry, which allows us to have more data that is orders of magnitude better data than other PR tools. The other difference is the purposeful exclusion of junky results–normally the product bulk web crawling– that other tools pass off as "coverage." It doesn't do your company any favors to pretend that you get thousands of articles when you really get hundreds or even just a few dozen. And you certainly don’t get credible insights on trends in tech industry media activity when you use platforms whose data is a house of cards. TechNews focuses on actual writers who produce actual coverage, optimizing our UI to meet your most common use cases. TechNews is the only directory that's specific to the tech industry. Typically, any tech-related search in TechNews yields 10x or more results than other PR platforms. Searches are based off actual coverage– junky web results– so you are discovering authors and opportunities on the basis of the content. Find authors based on their activity level in a given topic or their influence as a source. TechNews gives you the most accurate picture more efficiently and more comprehensively than any other option. Who just started writing about Facebook privacy issues, or the new malware threat that is lighting up the security industry? Who is actively writing about new consumer electronics gear at CES? These are the types of threads that tech PR pros are routinely pulling. TechNews is the only platform that lets you zero-in on authors who recently joined a conversation thanks to our Author Interest chart. For any tech PR pro who focuses on the new and hot as a key factor in their media outreach strategy, this is a truly unique capability that gives you a major new weapon in your research arsenal. There is a total addressable volume of authors and coverage within every topic related to your tech company or client. Do you know what that number is? Or are you using generalized tools that amass tens of thousands of junky results that they pass off as coverage? When you are using TechNews, you are using a clean dataset that focuses on authors and their coverage, not a press release pick-up, duplicate/syndicated coverage, or vendor blogs and advertorials. Our focus on data fidelity means that the trends you find in TechNews have meaning. It’s extremely beneficial when deciding where to place your bets on how you publicize your technology. Competitive comparisons are critical fuel for tech PR programs. You need to know precisely how you are doing– but even more importantly, you need to have a plan for the authors that are covering your competitors but not you. TechNews is the only PR platform that specifically tackles this common tech PR use case. We not only show you the pretty pie chart with coverage ratio, we give you a way to explore the exact list of authors and outlets that are covering your competitors, but not you. If you want to create silly charts that show you getting tens of thousands of clips, when you really get dozens, you may be happy with your existing charting tool. But if you are someone that likes to know what's going on and not bury your head in the sand, then TechNews gives you a more accurate answer to the question, "How are we doing compared to our competitors?” We then show you precisely the authors and outlets you need to spend more cycles on. Every tech company has a set of outlets that are of particular importance to their PR efforts. TechNews is the only platform that allows you to search directly within an outlet, breaking down articles by author so you can learn more about your most relevant targets. You can even search within multiple, specific outlets at once. The granularity that we provide in exploring any specific outlet is something that no other tool does (let alone with tech industry-specific outlets). You know that an author writes about cloud, but when was the last time they wrote about Amazon Web Services? You know that an author writes about security, but when did they last cover the sub-topics most relevant to your company? If you believe that simple industry beats like "security" are overly generic– and you want to investigate authors on a more precise level– TechNews is the only platform that allows you to search within a single author, or even groups of individual authors all at once. Sometimes you have campaigns (e.g., funding, company launch, major product launch, etc.) that ask you to consider a number of angles as you assemble your list of targets. Who has covered us before? Who covers x, y, z topic or competitor? You find yourself working on a spreadsheet in one window, a media directory in another, and doing Google searches in a third. TechNews' Lists combines the Search and List functions so you don’t need to jump between screens. Keep all your lists in one place and utilize the various efficiencies that come with TechNews Lists: saved searches, comments, labels, the ability to collaborate with your team, and simple exporting methods. Events and awards tend to be a really messy thing to track. There are tons of them, and tracking them in a spreadsheet is drudgery. That's why TechNews indexes 25,000 tech events and awards and makes them keyword searchable. Find them, save them to your list, and export them. It's a workflow that removes the most cringeworthy aspects discovering event, call for speakers, and awards opportunities. It's yet another major differentiating feature of TechNews compared to all other PR platforms. Artificial Intelligence (AI) is one of those topics that’s got so much going for it on on all three of those areas, it will be a lightning rod for media coverage for many years to come. Sure, there is the whitewashing of vendor products and hype way ahead of real use cases. But the business world’s massive investment in unlocking data assets, the move towards real-time everything, and the maturity of the machine learning, natural language, and AI-related developer frameworks and programming language abstractions– those are all real, and it’s going to be an exciting ride. We thought it would be useful to illustrate some facts about the volume of interest in AI by tech industry authors, and the rate of growth of that interest. TechNews is the only PR platform that allows you to explore the many thousands of authors and outlets jumping on AI in coverage, so take a trial if you are interested to learn more about how our dataset can help you organize your PR efforts in AI. The tech media in 2018 will produce roughly 108 thousand articles about AI, up more than 30% over 2017. This excludes press releases, duplicates, and other web-crawl junk that other PR platforms emphasize, focusing strictly on original content written by tech journalists. With over 25% of the year remaining, already more than 6400 authors have covered AI (compared to roughly seven thousand authors TOTAL in 2017). Here’s what the growth in net-new authors covering AI looks like over the past five years. As we approach EOY high volume news cycles around events like Dreamforce, we expect to see another major spike in authors covering AI for the very first time. At this stage of development, AI is more of an industry in itself than a single piece of technology. There are numerous sub-topics under the AI umbrella, where PR Pros can niche down and target a smaller, more specific audience. If you are a vendor whose PR goals include more prominence in the AI conversation, TechNews can be an incredibly valuable resource for evaluating the important authors / outlets / conversations you need to plan around. So take a trial if you are interested to learn more about how our dataset can help you organize your PR efforts in AI. Getting great publicity as a tech company isn’t just about one thing. Newsworthiness, storytelling, relationships with media, market traction, pedigree of the founding/exec team, and n- other considerations are among the success factors that will determine how often you see your company in headlines. You and your PR team will be able to control some of those variables while being completely at the mercy of others. But one thing that’s absolutely in your control is how well you do your homework. Companies who earn coverage always put a premium on relationship-building, understanding the news cycles, what’s being written by whom, and the nuance that really drives the coverage. And this is why they use TechNews. TechNews gives you access to the most comprehensive PR database in the tech industry. The powerful search function is your first step to better understanding the mediascape and your company’s place in it. Build relationships. It’s important to build rapport with journalists before pitching them. Use TechNews to search for the top authors in your niche and save their contact information to start that relationship. Find the right outlets. Quality is better than quantity when it comes sending out press releases. Your story needs to be relevant to an outlet’s audience. Find the outlets that write about your niche, company, or competitors most often and target them with a newsworthy story. Know Thy Audience. Before pitching an author or outlet, read up on their latest work. Find out what they like to write about and tailor your message to fit. TechNews is invaluable for this kind of recon before a campaign. Ride the Popular Trends. Your company may not generate a lot of press on its own. But you can always ride the wave of a larger news story in your industry. Search for trending topics and figure out how to make your company relevant to the larger story. When you login into TechNews, Search will the be the first page you see. Start by adding your company name, industry, or competitors in the search box. Add advanced search options by clicking the arrow at the far right of the search box. You can filter searches by time, authors, outlets, and location. Authors. Click on any author to view their profile, including contact information, outlets, and recent work. Outlets. Click on an outlet to see prominent authors and recent work. This also gives you contact information. Companies. These are the companies most often mentioned in the discussion. The green bar shows you how much coverage they receive relative to other companies. Articles. Sorted by most relevant, you can also sort by time and alphabetical order. Click the article to view the original post. You can also search for multiple terms at the same time. For example, you can search for ‘Kubernetes’ and ‘containers’ to see the results for both. To learn how to do this, check out our help guide. This is just the beginning of how TechNews can help you plan for your next campaign. Read on to learn how to use Lists, Charts, and Events. TechNews Search helps you navigate our comprehensive tech PR database. But what do you do with the results? That’s where Lists come in. Lists help you stay organized by saving all your target authors and outlets in one place. You can also save PR clips. Simply export the list and you’ll have everything you need to run your campaign. Campaign: Make a new list for each PR push. Topic: Organize your lists around different niches like Kubernetes, containers, and DevOps. Location: Have different lists for local, regional, national, and global outreach. Priority: Keep your most important contacts in one list and your prospective leads in another. Competitors: Keep a close eye on the competition and scope out ways to steal press. Click “Lists” in the navigation bar. Choose an existing list or click “New List” to start fresh. Once a list is chosen, enter your search parameters in the search bar. Click the star next to an Author or Outlet to add them to your list. To add Clips, click an Author or Outlet to pull up their profile. Then click the star next to the article you want to clip. Lists can be exported as Excel files and include names and contact information for your targets. This is a great way to find the most relevant authors in your niche and build relationships for long-term PR success. Whatever your PR strategy, Lists are an essential tool for staying organized. But that’s not all TechNews can do. Be sure to learn more about other features like Search, Charts, and Events. Ever wonder how your media coverage stacks up against competitors? How about your media coverage this year compared to last? Which media trends are still riding high, and which are on the decline? Benchmarking, competitive analysis, and market research are critical components of any successful media push, and measuring your results after a campaign is just as important. TechNews helps you answer these questions with its Charts feature. Charts pull in the most up-to-date tech media information and display it in a visually stunning format. Charts are perfect for pre-campaign planning, post-campaign analysis, presentations, and stakeholder meetings. Share of Voice are pie charts that let you visualize your media coverage compared to competitors. Add the names of your company and your competitors to see what percentage of the coverage everyone receives compared to each other. Alongside each chart is a coverage breakdown by outlet and author. You can see that Silicon Angle (3rd from the top) has much more balanced coverage than other outlets. You can view Share of Voice data up to a 5-year timespan. Freeform charts let you compare coverage of anything and everything over a period of time up to 5 years. Compare competitors, industry buzzwords, or brand names vs. the generic industry. For example, here is a chart of media generated by the big public cloud providers over the last 5 years. You can click on any point on the chart to view the coverage results from that time period. As you can see, despite only owning 13% of market share, Azure has beaten AWS in media coverage almost every quarter of the past 5 years (AWS owns 33% market share). Google Cloud, which owns only 6% of the market, also earns outsized media coverage. All of the earned media is starting to pay off for Microsoft, who made a big jump in market share in the first quarter of 2018. Freeform charts are a great way to explore these types of trends and also to prove the value of positive PR. The last chart template is the Year Over Year Comparison, a vital metric for measuring performance over time. How much media coverage have you received this month or quarter compared to last year? As you can see, despite a massive year in 2017, the Kubernetes PR team continues to crush it by more than doubling YoY media coverage in June. You can also run YoY comparisons on your competition to see which way their PR is trending. Click the Charts tab and choose your template. Add in the keywords or brands you want to chart. Set the timespan (ranging from 1 month to 5 years) and time interval (month, quarter, year). Choose whether you want to chart clips, authors, or outlets. Run the Chart. It is automatically saved to view later. You can also export the chart to use in presentations or spreadsheets. Plan better campaigns and measure your results with Charts. Check out TechNews’ other features to amplify your PR reach even further. Speaking opportunities and awards are gems for earned media coverage and a chance to elevate your brand’s reputation in the industry. The problem is, with so many tech events around the world, it’s hard to find the right opportunities and keep track of deadlines. The struggle ends with TechNews Events: the only comprehensive events and awards calendar for tech. Use TechNews to find relevant events based on industry, proximity, or time period. Save the events on TechNews and keep deadlines organized for the entire year. Find Relevant Events and Awards. Search for events and awards based on industry, location, or time period. For example, you can target just big data events in San Francisco or all tech events in Boston. Save Deadlines. Never miss a deadline for speaking engagements or award submissions. Deadlines are updated by pulling info directly from the event website. See Who Covers Each Event. 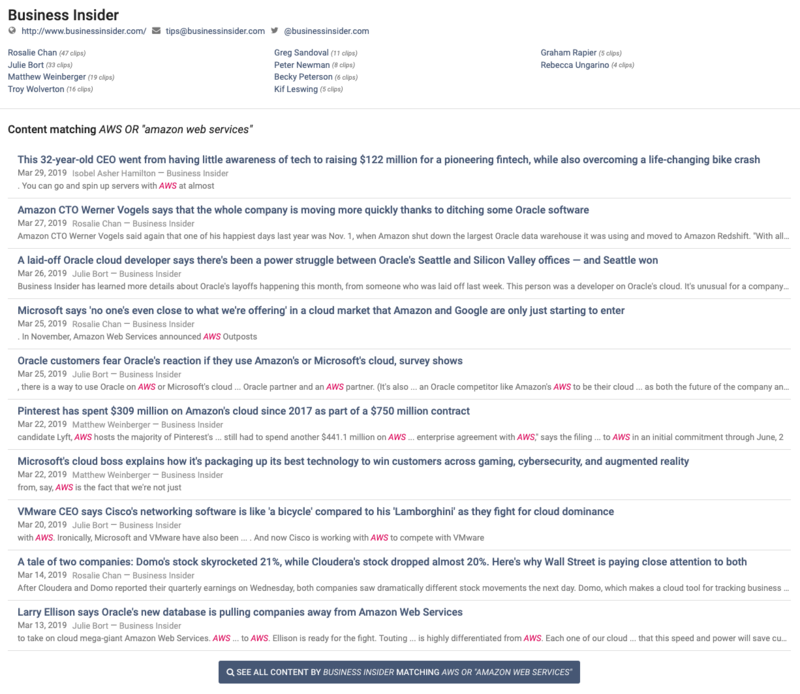 Technews aggregates media coverage surrounding each event, including top authors and outlets who write about it. Once you line up your deadlines, you can find relevant authors and outlets to cover you. Store all information in TechNews. No more disparate calendars and spreadsheets. TechNews saves all Event information for you, including deadlines and upcoming events in your area. Chose a Calendar. Events start with a default calendar, but you can create multiple custom calendars of your own. To create a new calendar, click on the “Events/Awards Deadlines” dropdown at the top left and then “Create a new calendar”. Search for a keyword. Keywords can be an industry, product, company name (like Microsoft), or a location (like Boston). Filter your results. You can filter results by Events only, Awards only, or by International events. To see only upcoming events, click the “Deadline” filter. The stars next to results indicate Most Popular Events. Click Event for More Info. Click on the result to see a description of the event and media coverage information. Follow Favorite Deadlines. To save events and deadlines to your calendar, hit the “Follow” button next to the result. Each deadline you follow will show up in your calendar on the left side of the screen. Then you can export your calendar to a spreadsheet. Events are a great way to supplement your earned media coverage. Get the most up-to-date event deadline information and save it all in one place with TechNews. Forbes and Bessemer Venture Partners' Cloud 100 (http://thecloud100.com/) calls itself the "definitive list of the 100 top private cloud companies and the 20 risking stars poised to join their ranks." Since its inception it's been a prestigious distinction for any startup vying for recognition in what's a super competitive product category. "Most information is included in the FAQ, however the Cloud 100 Judging Panel, which is made up of the public cloud company CEOs, is interested in growth numbers. Highlighting your company’s growth rate, projected ARR, as well as any other numbers that show you are one of the world’s fastest growing cloud companies will help your nomination get noticed. In addition, the Judges will be looking for companies that are addressing diversity in the industry." It’s been nearly 7 years since Marc Andreessen’s famous observation that, "software is eating the world". A recent keynote at IDC’s Directions event in Santa Clara– “Developers in the Driver's Seat”– cited 11 million worldwide developers as the key to success in just about every exciting new technology wave to come. There are tens of thousands of companies vying for their piece of the developer pie. PR pros in the world of developer technologies are tasked with elevating their brands above the noise, where concepts like “developer productivity” and “digital transformation” are overused to the point of meaninglessness. In this clamor for attention, the PR pros with the deepest insights and targeted messaging will win the news cycle. Companies that carpet-bomb poorly built media lists with marketing drivel always lose, but especially in this sophisticated developer news domain. This TechNews PR Guide looks at media coverage trends for developer technologies and makes 4 key predictions for 2018. These predictions will help you get out ahead of some important trends that are sure to drive the developer media agenda throughout 2018. Spoiler: If you’re publicizing companies in the Cloud, Kubernetes, VR/AR, and Java spaces, this report is for you! At face value, you might think that media interest in Kubernetes would have a ceiling that equals the roughly 1,000 authors that follow Docker containers. After all, Docker is the most popular container format, and Kubernetes is a container orchestration platform. However, it’s likely that Kubernetes has a PR ceiling closer to the nearly 3,000 authors that routinely cover AWS. That’s because Kubernetes is finding significant traction outside of Docker on platforms like AWS and Azure. In fact, the Cloud Native Computing Foundation says that 63% of all Kubernetes workloads run on AWS. Enterprise vendors have been rushing to replatform their offerings and jump on the Kubernetes bandwagon (Including Docker after a year-long holdout). The “how Google runs its infrastructure” allure is a runaway freight train. Kubernetes is just getting started. Let’s be honest– Java may still be the most popular enterprise programming language, but author interest in Java infrastructure has been on a steady decline for years. Java media attention plummeted while Oracle/JCP had ownership of the Java EE platform. Meanwhile, Docker and Kubernetes claimed the higher ground in distributed computing and cloud-native workloads. Despite its massive installed base of legacy enterprise systems (and the 12 million Java developers globally), the Java application “stack” (including the JVM) has somehow fallen out of the conversation. This is also despite the strong connection points between Java EE and containers. But that is about to change with the transfer of Java EE to the Eclipse Foundation. We predict Java will get its mojo back this year and become the hot tech topic it once was. 2018 will bring a renewed surge of vendor support, and along with it plenty of PR opportunities for the companies that align with the resurgence. There is a lot of money up for grabs for the companies that sell developer tooling around legacy modernization, cloud-native enablement and all things -Ops (DevOps, DevSecOps, you name it). Consider the buzzword bingo in developer use cases today. VR, AR, AI, ML, Deep Learning, IoT. It’s hard to determine “what’s next” in terms of a form factor shift that would rival, say, the commercial web or mobile. But VR, AR, and AI stand the best chance to take the commercial form factor lead in 2018, for a few reasons. Unity Technologies– who is behind the gaming world’s most used 2D and 3D platform– recently partnered with IBM to develop the Watson Unity SDK. Not only can gaming developers add a powerful AI engine to their games, but enterprise software will see a surge in AR and VR applications. We expect to see awesome new business use cases that offer immersive, intelligent environments for enterprise users. Could this mean a major replatforming in web development? We’re not sure, but when every business has a website, and immersive environments become easier to develop, is it really that big of a jump? The commercial web followed a similar adoption curve. In the beginning– when everyone was building their site and talking about “community” ad nauseum– it seemed to be all hype. But then, lo and behold, it hit critical mass and we started to see the really interesting commercial applications take flight. 2018 will be a big year for AR, VR, and AI startups, especially for those companies working on business solutions. Ears in the media are piqued to learn about the next transformation in enterprise software, and advanced use cases built on these enabling technologies will carry that water. I heard one developer correct another on a recent call, when the former called AWS the 800lb gorilla. The other said no, they’re more like a tectonic plate. In terms of media coverage, Azure is punching way above its weight class compared to their actual market share (Azure has 10% of market compared to AWS’s 47%, according to this report). This is another big victory for a Microsoft PR team that has shed the “evil monopoly” baggage of the 90’s and early 00’s, and is even widely seen as super cool and relevant in Open Source. Despite intense competition among public clouds, it’s strange how homogenous the value propositions are. I talk to developers frequently and ask them why they use the cloud that they use. I rarely get clear answers. Looking back, I can’t even say what compelled us to use AWS to host our service, other than it was the safest bet. We all remember the “Be Like Mike” Gatorade commercials. We drank a lot of that Gatorade and were never able to touch the rim. With Kubernetes’ ascension and the huge interest in Tensorflow, Google could be ready to bust out of the “also-ran” category in the public cloud race, winning developer hearts and minds with the “Be like Google” promise. What does this mean for Azure and AWS? It will force the leading cloud platforms to keep differentiating their developer stories in new ways. Whether they do that through acquisitions, partnerships, or native development is yet to be seen, but the entire public cloud ecosystem should see a surge of interest and media coverage because of it. For developer technologies that delivers true differentiation, these public cloud providers will be massive channels for adoption. The PR pros who establish partner marketing and PR relationships with the industry gorillas will stand to win this hard-fought battle for attention. Media coverage has increased significantly for the topics we covered in this article (apart from Java). 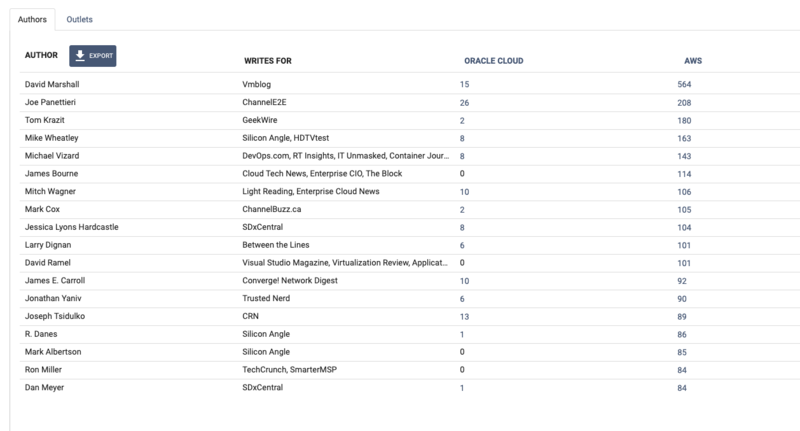 Just look at the big public clouds, that combined had almost 50,000 articles written about them in 2017. With so much interest in the evolution of developer tools, there are plenty of opportunities for smaller companies to add their story to the conversation. To do so, PR pros must send highly targeted messages to the right authors and media outlets. The traditional approach to media outreach is to spend hours creating a list of authors and outlets writing about your technology (trust me, I’ve been there!). That’s why we created the TechNews PR platform. With the TechNews PR platform, you can search for media connections based on tech topic, like Kubernetes, public cloud, or cryptocurrency. Build your lists right in the tool and export contact information in bulk. You can also create charts for your industry just like the ones you see in this article. Track media trends, competitors, and authors with simple and beautiful visuals. If you’re ready for a new way to build your PR campaigns, sign up for a free trial to try the TechNews platform. And if you want to receive more reports like this in the future, sign up for our media insights newsletter. The last quarter of 2017 saw a surge of cryptocurrency activity in the media and in the markets. Bitcoin had its incredible run starting in October, Ethereum experienced 10,000% year-over-year growth, and established entities from JP Morgan to the Australian government embraced blockchain as a truly disruptive technology. Even during unstable markets and high profile hacks, cryptocurrency media coverage continues to rise as questions about security and regulation hit the mainstream consciousness. This is all great news for fast-growing cryptocurrency and blockchain companies. These technologies and their value are much better understood than they were one year ago. The “newsworthiness” of the topic is no longer up for debate, giving companies a better chance to share their story and earn valuable media coverage. Of course, this is a double-edged sword. While crypto and blockchain startups have to spend less time arguing the merits of the technology itself, they are now tasked with communicating what makes their company different from all the others. This is an equally difficult task, but the payoff could be tremendous. This brings us to the purpose of this report: How does a company in this space get attention in the media? Assuming your company is doing something unique (which is not a guarantee by any means), earning media attention comes down to two factors: trends and opportunities. Identifying media trends and hopping on at the right time is critical for earning PR. Is a trend on the rise or on the decline? Will it have lasting newsworthiness, or will it fizzle out in a few months? In order to craft a newsworthy story, you must understand and accurately predict the trends in your niche. You also need to uncover the right media opportunities. Which outlets and journalists will be interested in telling your story? As you already know, developing a comprehensive list of authors and outlets is a tedious and difficult undertaking; it takes domain knowledge and diligence to identify the right relationships to target for your media outreach. Luckily, we’ve done some of the heavy lifting for you by compiling the top cryptocurrency media trends, authors, and outlets for the first quarter of 2018. This report will take a quantitative look at cryptocurrency media coverage and make predictions about its future. First we identified trending topics in the space by looking at the number of articles written in the past 3 months. Based on these trends and our industry experience, we then tried to predict where media coverage will go in 2018. Finally, we developed short lists of the most prolific cryptocurrency writers and media outlets from last quarter. This entire report was developed using the TechNews PR Platform features just a sliver of the information available. We track thousands of authors and millions of articles to give you deep insights into the state of media coverage in your tech niche. We track over 3,000 authors in the cryptocurrency space alone. Sign up for a free trial to see for yourself. This report will kickstart your goal of earning more media coverage in 2018. Without further ado, let’s jump into the top cryptocurrency trends, writers, and outlets for Q1. The second story is that blockchain as a media topic finally hit the mainstream after being dragged along by bitcoin and cryptocurrency since 2013. This is due in large part to Bitcoin’s rise in popularity, but blockchain is also becoming a standalone topic for media coverage. The “Blockchain meets X” storyline will rise in popularity 2018 as both startups and legacy enterprises experiment with blockchain. This is great news for businesses in this space. It means the newsworthiness of blockchain is separating itself from the volatile cryptocurrency world. Even if cryptocurrencies tank and fade away, blockchain is likely here to stay. At the time of this writing, Bitcoin is in the middle of its worst loss of value since 2015. There has been hysteria around Bitcoin ever since its stock started to climb back in October. Despite the current fallout, Bitcoin coverage continues to climb as investors and crypto-skeptics alike await to see when the bleeding will stop. Bitcoin’s media attention is not sustainable, however, and will level off as the cryptocurrency’s value normalizes. This makes the “Blockchain meets X” storyline even more important for blockchain companies. While blockchain has Bitcoin to thank for pulling it into the mainstream, blockchain has become a relevant story on its own. Altcoins (short for ‘alternative’ coins) have seen a surge of popularity. In 2017, altcoins like Ethereum, Litecoin and Ripple rode the coattails of Bitcoin and joined the conversation around cryptocurrency. We’ll continue to see speculation and bold predictions as analysts and investors try to predict “the next Bitcoin”. Ethereum had a huge 2017, with its value growing 10,000% to over $1000 per coin (although as of this writing, Ethereum sits at $743.74). Accordingly, Ethereum is the most popular altcoin in the beginning of 2018. Ripple has seen the largest growth in media popularity so far this year, fueled by stories about skepticism (“Is Ripple a “pure” cryptocurrency?”) and a partnership with money transfer firm MoneyGram. So what do these Cryptocurrency news trends mean for 2018? We compiled a few predictions based on what we’ve see so far. In 2018, we will see the flood of Altcoins hit the cryptocurrency market in an attempt to displace Bitcoin at the top. New coins are being developed by everyone from legacy enterprises (Kodak), to world governments (Russia’s “crytorouble”), to peer-to-peer networks (Dogecoin). Ethereum, Litecoin, and Ripple are currently leading the way in terms of media coverage, but the race has just begun. Most of the media landscape covering cryptocurrency have yet to peel the onion back much further than looking at Bitcoin specifically, but it seems inevitable that this will change in 2018. It was a common meme throughout 2017 to surface noted celebrities’ opinion on the investment viability of Bitcoin (e.g. Warren Buffett and Mark Cuban). But the greater ongoing consternation to investors is to what extent the Feds will meddle. Any legislative hearings or anything bordering on new regulation is going to draw tremendous media attention around Cryptocurrency. In January alone, there were nearly 5000 articles written about Cryptocurrency and government regulation. The chart below illustrates the swift increase in articles on cryptocurrency regulation. Two of the top stories were about the US government cracking down on crypto corruption, and South Korea banning anonymous cryptocurrency bank accounts. The nature of a “digital currency” is a juicy story for any security-related author, and all new incidents and attacks are going to draw a lot of media coverage. This prediction is highlighted by one of the biggest crypto stories of 2018 so far: Coincheck’s $530 Million Cryptocurrency Heist May be the biggest in history. From a media standpoint, hacks and heists actually bode well for security-related companies working in the space. Any progress made in securing blockchain and cryptocurrencies draw plenty of news coverage. We referenced this prediction earlier, but it’s worth taking a second look. 2018 will be the year we start to see blockchain make a tangible impact on business. Healthcare, finance, and law are all industries poised for disruption by blockchain. We’ll also see other technologies enhanced by blockchain, including cloud computing and IoT. In particular, we expect to see “blockchain-as-a-service” and “enterprise blockchain” rise in popularity this year. Microsoft, big banks, and several startups are bringing these services to life and forward-thinking enterprises are already adopting it. Blockchain is entering the golden hour of media coverage where adoption ramps up but the glimmer of newness still remains. As a marketing or PR professional, building media relationships is one of the most important aspects of your job. That’s why we developed the following list of 16 trending authors in the cryptocurrency space right now. This list is based on the number of cryptocurrency articles written in the last quarter. While quantity isn’t the only important metric, it’s a good way to determine a person’s domain interest and influence (to a degree). For each author, we also include the outlets they write for and 3 recent articles. This information should help you further evaluate which writers you should get to know. Let’s look at the top Cryptocurrency authors from last quarter to see what they’ve been writing about. For a list of over 3,000 cryptocurrency authors, be sure to check out the TechNews PR platform and sign up for a free trialsign up for a free trial. 1/31: Bitcoin, Ethereum and Litecoin: Is It Worth Taking the Risk? 1/31: Who Is Roger Ver, aka "Bitcoin Jesus"
1/31: Ripple (XRP) Is Falling - What Is The Reason? Another good strategy for building media relationships is to target specific media outlets that cover your niche. Below are the top 23 cryptocurrency news outlets based on the number of articles written last quarter. Again, this metric isn’t perfect, but it’s a good place to start. 2/1: Tezos Has a New Board, But What About the Money? Cryptocurrency is a uniquely volatile space for both business and media. This is no surprise; combine two of the most speculative industries (finance and tech) and you’re bound to have have hysteria. As a marketing or PR professional, your job is to see through the hype and identify the trends that have lasting power. After all, your company or client isn’t just trying to win the next media cycle; they want to win a permanent piece of a massively disruptive industry. The trends and predictions in this report are designed to help you craft better, more newsworthy stories in the cryptocurrency space. Unfortunately, these trends are subject to huge changes that we simply can’t reflect in a static report. To stay on top of the latest media trends day-to-day, try the TechNews PR Platform. It’s the only PR tool designed specifically for tech. All the insights in this article were pulled directly from the platform, which means you can do the same and more for your company or client. Trying out TechNews is totally risk free. Just sign up for a free trial and see for yourself the difference that insight can make. Here are some opportunities for your radar in February. There are 25,000+ other event / award deadlines to explore in TechNews. Want to get your event or award deadline on TechNews? Just submit the event URL and deadline in the comment section below. Note: We're purposefully NOT including vendor events / awards. Tech is one of the most exciting niches in the PR world, attracting the industry's best talent and most creative agencies. We're often asked to make candidate recommendations, so we are trying out a new feature in this newsletter: the Tech PR Jobs Board. fama PR is looking for ambitious tech PR professionals who are ready to take their career to the next level at an elite boutique agency. Candidates should have experience working with clients that run multiple programs targeting business and consumer audiences in the tech sector. We’re looking for independent self-starters who can easily adapt to a team-based environment and flat structure where everyone gets involved in completing account work. For more information, please visit www.famapr.com or email us at jobs@famapr.com. Interested in posting your open PR position on TechNews? Contact travis@technews.io to be a part of our next newsletter. Got a question, problem, or feedback? ©2007 - 2019 ITDatabase. All rights reserved.